Welcome to the Best Western Chicago Southland where customer service is top priority and accommodations are comfortable, warm and affordable. 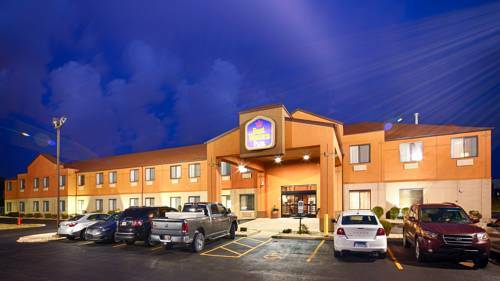 The Best Western Chicago Southland hotel offers convenient access to many local attractions, shopping and dining options in and around Oak Forest Illinois. Tinley Park, IL and the Tinley Park Convention Center are conveniently located nearby. The Hollywood Casino Amphitheater hosts world-class shows and is a major draw for many of our guests. Chicago Gaelic Park is located in Oak Forest and provides an oasis from the hustle of the city. This Best Western hotel is convenient to downtown Chicago and is just 25-30 minutes to downtown dining and shopping. Located right off of I-57 and I-80, you can stay in the suburbs for the peace and quiet and be in downtown Chicago in just a few minutes. Enjoy a great value with fantastic rates. Our modern rooms boast modern amenities. Don't forget our free breakfast that features hot items that change daily such as eggs, sausage, biscuits and gravy, breakfast sandwiches as well as daily favorites: waffles, fruits, sweet pastries, hot and cold cereals, yogurt, chilled juices and 100% Arabica coffee. Business travelers can enjoy the convenience of our meeting facility that holds up to 50 occupants, and our upscale rooms are just what South Suburban travelers deserve. A microwave and refrigerator in every room is standard, as well as the 32-inch flat screen TVs and free Wi-Fi. The indoor pool, hot tub, and fitness center is a favorite perk. Book a spacious room at Best Western Chicago Southland for your next visit to the Windy City! Pool - 2.9 mile(s) from On Cue Family Billiards, pool hall. 3.33 mile(s) from Country Club Amphitheater, outdoor concert venue. 5.46 mile(s) from Standard Bank Stadium, Windy City Thunderbolts Minor League Baseball. 24 mile(s) from Soldier Field Stadium, home of the Chicago Bears. 30 mile(s) from Wrigley Stadium, home of Chicago Cubs Baseball. 26.6 mile(s) from Chicagoland Speedway, NASCAR racing. 24 mile(s) from US Cellular Stadium, home of the Chicago White Sox. 1980s-themed coffee shop The Wormhole, with full-size "Back to the Future"-style DeLorean. ~22 miles from Oak Forest. ~18 miles from Oak Forest. An ostentatious private home of the Onan family, dazzling in sunlight, fit for the old gods of Egypt. Includes a three-pyramid garage, King Tut's Tomb replica, and towering statue of Ramses. ~58 miles from Oak Forest. ~63 miles from Oak Forest.